It was at Baselworld 2016 that Seiko announced the international launch of the Presage collection. Thanks to a diversity of designs, outstanding value for money and a wide range of calibers, Presage has captured the hearts and minds of lovers of fine mechanical watchmaking the world over. 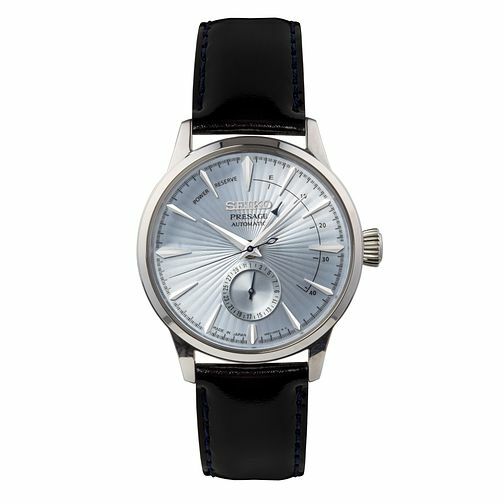 This Cocktail Edition Presage has a deep pressed pattern sunray dial, whose shimmering beauty is enhanced by seven layers of gloss finish and the clarity of the box-shaped crystals. The hands are delicately curved by skilled craftsmen and women to give the watch case a slimmer profile. When turning the uniquely shaped crown, you can feel the strong torque of the winding mechanism. Seiko Presage Men's Black Leather Strap Watch is rated 4.0 out of 5 by 1. 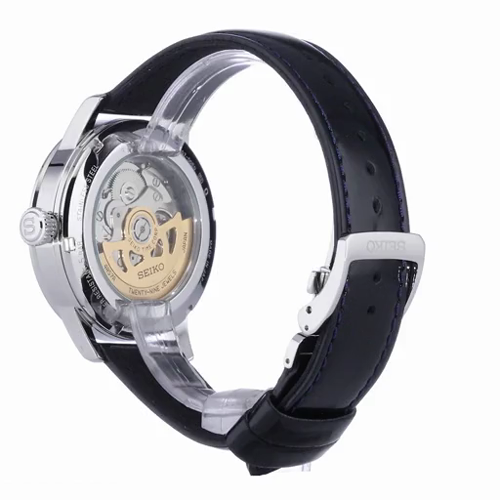 Rated 4 out of 5 by Anonymous from Clean looking elegant watch The watch itself is good quality for the money. The black patent strap isn't very nice and feels a bit cheep. The dial is absolutely stunning and the size of the watch is nice, could maybe be a little slimmer and have slightly longer lugs. Saphire crystal would be better too but for the money pretty good. Definitely worth the money and looks exquisite on an ink blue suede strap.